Chancellor Tim White. 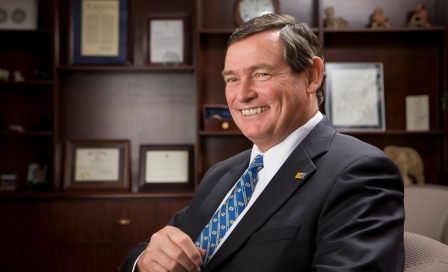 Chancellor of the University of California, Riverside. In my dream, I am on my way to his house to eat dinner with him, along with a ragtag group of others that I can’t recollect. When I meet up with Tim, for some reason we must walk from his house to some restaurant. We’re walking through barren fields with rundown homes. And there are tornadoes. A lot of them. One came right beside us and I reach out and touch it. We get through the tornadoes and we end up in these slums, where there are tons of homes crammed together. We’re crawling through garbage and trying to find our way to this restaurant. We can’t find a way through. We end up in this woman’s backyard and she is watering the grass. She gives us permission to go through her living room. And suddenly we’re in a jazz club. Tim White sits and the rest of us sit down. I realize the other people we’ve been walking with are all wearing sunglasses and smoking. They’re jazz musicians and they’re talking about performing. I order a burger and it comes to me in a jar. The burger is squished inside and there are fries sticking out the top. I look around and I feel really out of place.